Who hasn’t wanted to be a back up singer? My first consciousness of this particular species of humanity was when I saw Gladys Knight and the Pips perform Midnight Train to Georgia on Soul Train in the early 1970s. I suspected that I should not be deriving such pure pleasure from seeing three men in immaculate suits moving in honeyed unison as if they were performing some seriously important task akin to healing or miracle working. I wanted to be a Pip, if only to possess a license to pull an imaginary train whistle and wear really loud clothes. Clydie King is one of those amazing singers who seems to have backed up everyone from the Rolling Stones (Exile on Main Street), Steely Dan (Can’t Buy a Thrill), Lynyrd Skynrd (Sweet Home Alabama), Ray Charles (many many songs) and of course Bob Dylan (most of his Born-Again era work). 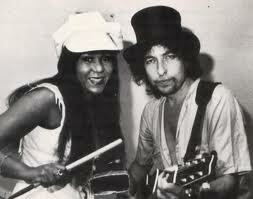 Indeed, Clydie did more than simply back Bob up in the studio. She, for a while, was his wife, or at least ‘main squeeze’ and is said to have born the great man two children. Some even claimed she was instrumental is ‘leading him to the Lord’. They say every back up singer’s dream to be the headliner. 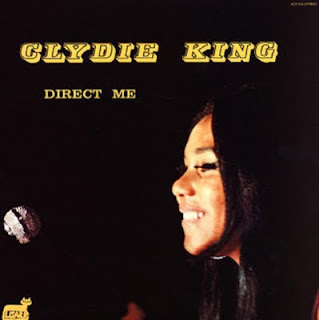 And Clydie King was no different. She issued several records under her own name and tonight, we present her debut album, Direct Me. Certainly not as nasty as Betty Davis, but neither as cotton candy as Diana Ross, Clydie’s voice brings back a rush of memories of 70’s American soul. Upbeat or slow, she’s got some chops and you can see why she was in such demand by all those white boy rockers! Thanks so much Alex. What a riot! Love it! Warm, horny sound, complete with wah-wah guitar and background vinyl scratches ! JPB, glad you're able to enjoy it. Thanks for stopping by WD and your kind comments. Hi, just found you here - any chance of a repost? Thanks!